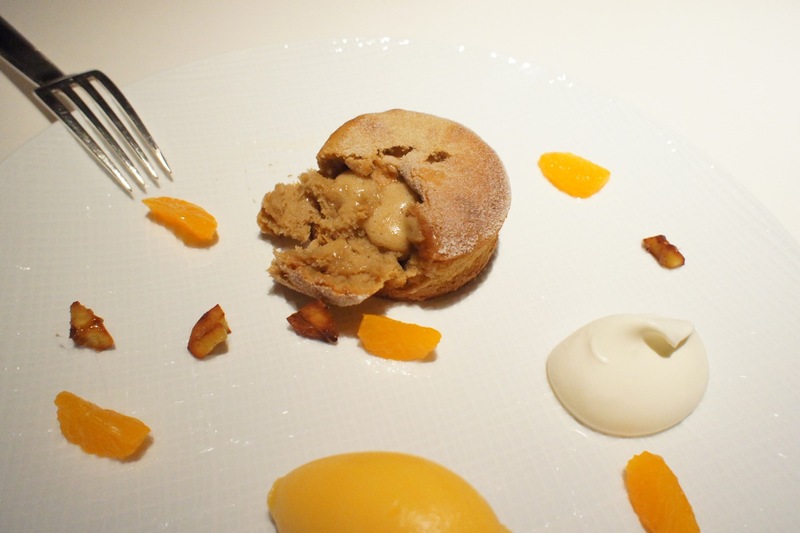 Pierre is a 2-Michelin star french restaurant in the Mandarin Oriental Hotel in Hong Kong. It is one of the restaurants of the renowned French maestro Pierre Gagnaire (whose flagship restaurant we wanted to dine at the last time we were in Paris, but we could not get a table and ended up at Ledoyen instead. No complaints though), and I was fortunate that he was in Hong Kong at the same time I was to celebrate Pierre receiving its second Michelin star for 2011. 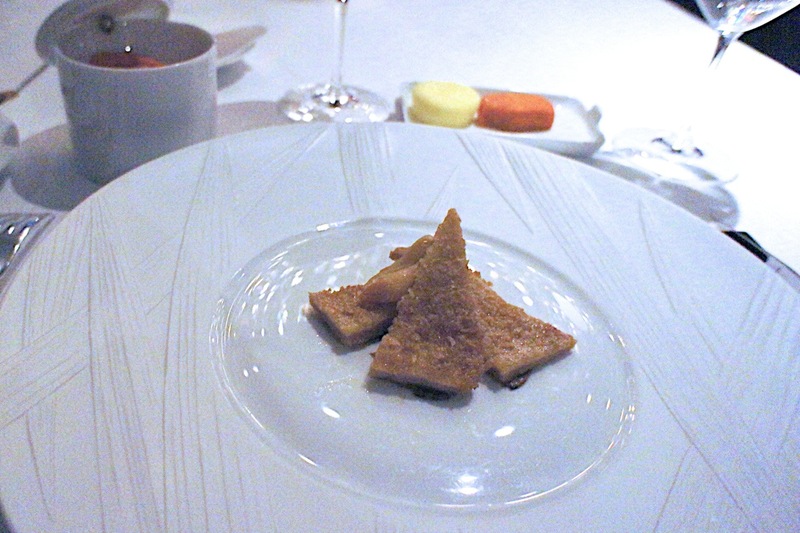 Needless to say, as I was also staying at the Mandarin Oriental that week, I had to make a booking to have dinner at the restaurant while Pierre Gagnaire was there to supervise his kitchen. Going up to the 25th floor of the hotel, the entrance to this restaurant is not immediately apparent, as there is no 'door' and one has to go down a dark corridor at one corner of the lift lobby to find it. The interior decor is very luxurious with crystal chandeliers and floor-to-ceiling windows with stunning views of the Hong Kong harbour. The dining room is deliberately dark in order for guests to be able to take in the views, however, the one complaint I had was that the dining tables were not well lit either. There were down lights but these were not properly aligned to the tables, which resulted in some tables (mine included) which were practically in the dark. Aside from the fact that this made it almost impossible for me to take any proper photographs without flash photography (which I don't do to avoid annoying other diners), I could hardly read the menu too, which was a bit of a problem. I cannot understand how the restaurant can expect its guests to enjoy the visual aspects of its food (of which considerable effort is put in by the kitchen) if its guests are expected to eat their meals in darkness. The resulting photos I managed to take below were taken with an ISO of 6400 which was possible to the credit of my camera but the downside of which was the 'noise' in the pictures. The highlight of the evening was the appearance of Pierre Gagnaire himself, as he came by each table to greet each diner. I opted for the Spring Menu with wine pairing, as I was dining alone and hence it was not practical to order an entire bottle of wine. The wines served with each course were good, and the sommelier was kind enough to give me an extra glass of each of the wines which I liked. The views at this restaurant are fantastic, yet somehow the service was not of the standard expected of a top Michelin restaurant. Don't get me wrong, the staff were all extremely friendly and helpful, however, things just didn't work like clockwork in the manner which you would find in other restaurants of similar standing; which was surprising even more so given that Pierre Gagnaire himself was in attendance that day. For example, they forgot to serve me bread, even after I had been sitting at the table for 20 minutes and had ordered my food. 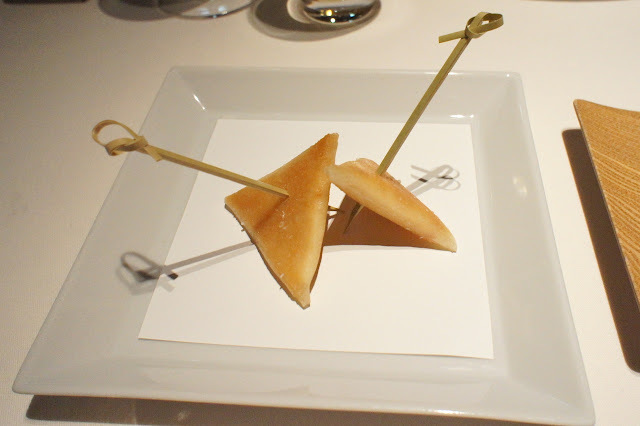 In fact, bread only came after my amuse bouche and at the same time as my first course. Also, after dinner, I was not asked if I wanted a digestif and was not served any petit four. 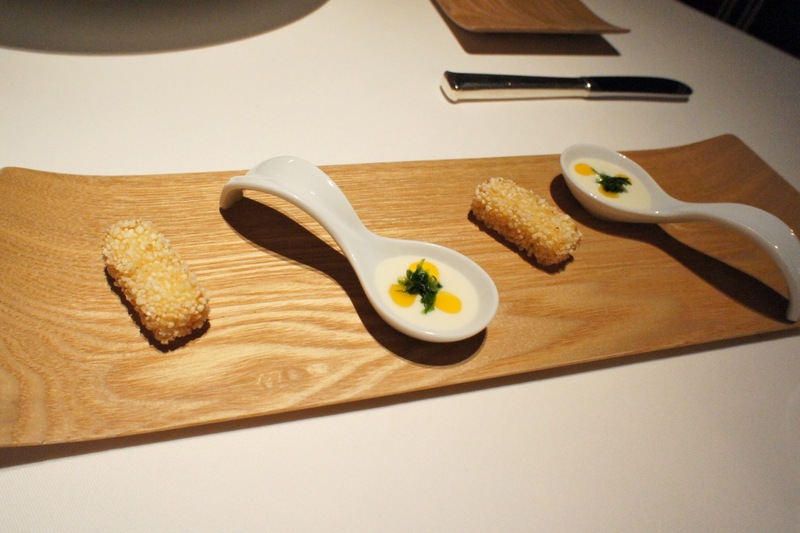 As for the amuse bouche, it was very forgettable and because the lighting was so bad, I could not see it properly and hence still do not know what it was or was supposed to be. My first course was pretty good: the duck liver foie gras, glazed pigeon fillets, marmalade of apple and shallots with cinnamon, gellified infusion of artichoke with star anise, and tree tomato iced pulp. It was interesting that the description seemed to contain more food than I could find on my plate! Though I only realised that the marmalade of apple and shallots with cinnamon was actually at the edge of the plate as if it was scooped up accidentally from another dish. The next dish was (1) the green veloute with hazelnut butter, lettuce stuffed with beans and peas a la francaise (in the long thin plate), (2) the vegetable basket with fresh morel mushrooms with yellow wine and crunchy quail eggs (in the main plate), and (3) the asparagus flan with tarragon whose tips are seasoned with pistachio oil (in the smaller round plate). This was an excellent dish. The mushrooms in the gelatinous basket were rich and superb while the side dishes were also very good. Next: sole fish cooked in the pan with butter then dried; watercress salad, leek stalks, green pepper with mariniere of razor clams with seaweed. This was disappointing. The fish was unremarkable and was totally overwhelmed by the very strong taste of the razor clam marinate. It might as well be a razor clams dish without the fish. The best dish of the evening was the lobster fricassee with fresh ginger, endive fondue with white balsamic vinegar, bisque creamy like a curry accompanied by black forbidden rice. 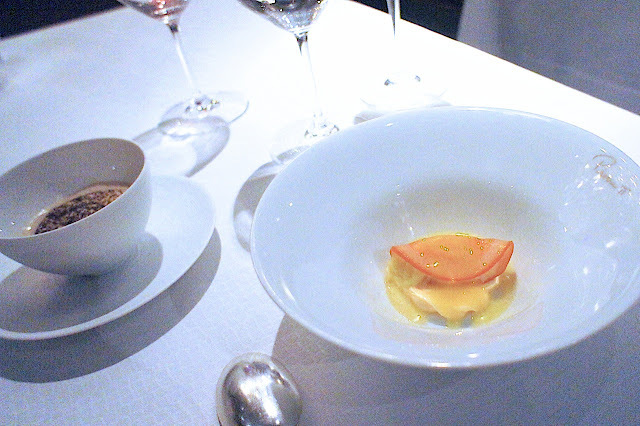 This was a top-notch dish worthy of this restaurant and the Chef himself. The lobster was juicy and sweet and the lobster bisque had a tinge of curry to it. 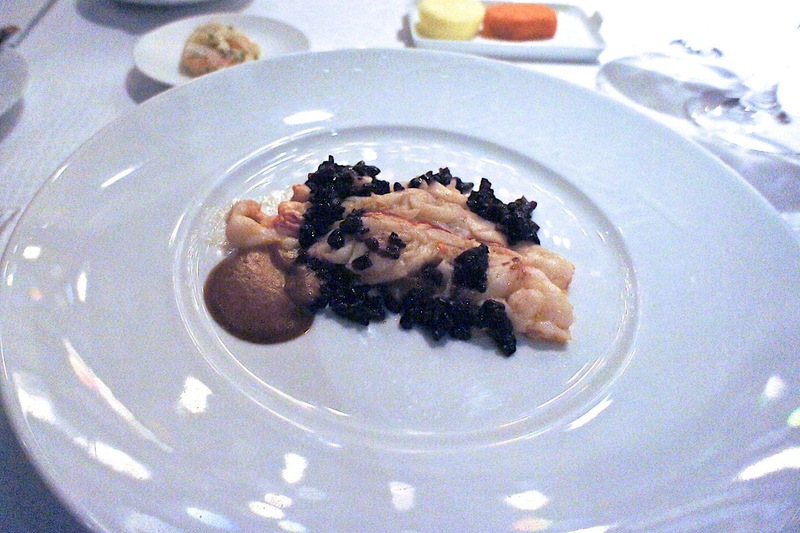 The slightly sweet black rice was excellent alongside the lobster as well. I couldn't figure out why the rice was forbidden though. The palate cleanser was the blue velvet sherbet, diced cuttlefish seasoned with sticky citrus juice and thai grapefruit. 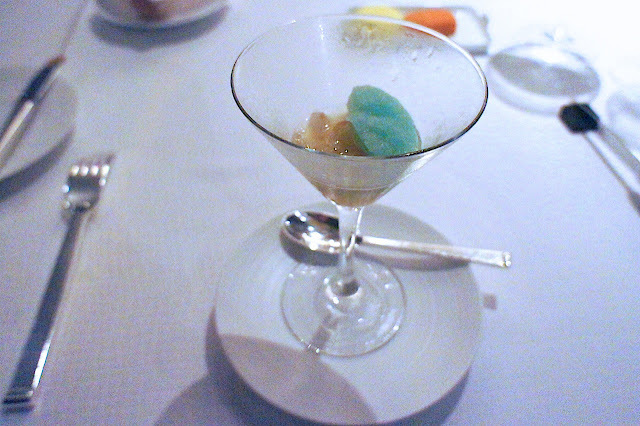 This was a massive FAIL: DO NOT MIX CUTTLEFISH WITH SHERBET ICE CREAM! 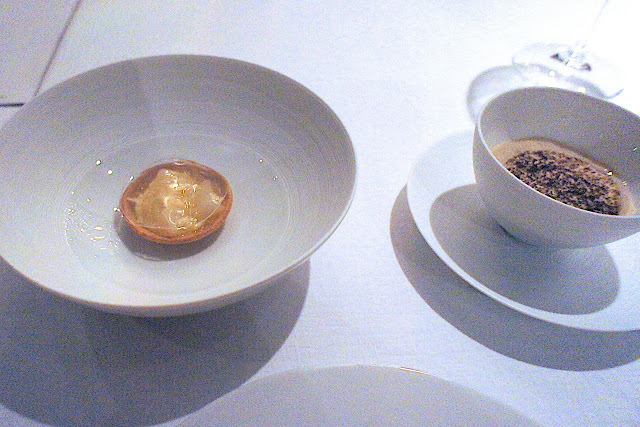 The main course was a dichotomy of the very good and the plainly average. It was the French milk calf (1) end of veal loin with lime and honey and vichy carrots and button mushrooms and (2) breaded cutlet, caper, lemon and Cremona mustard like a relish with spring onions. 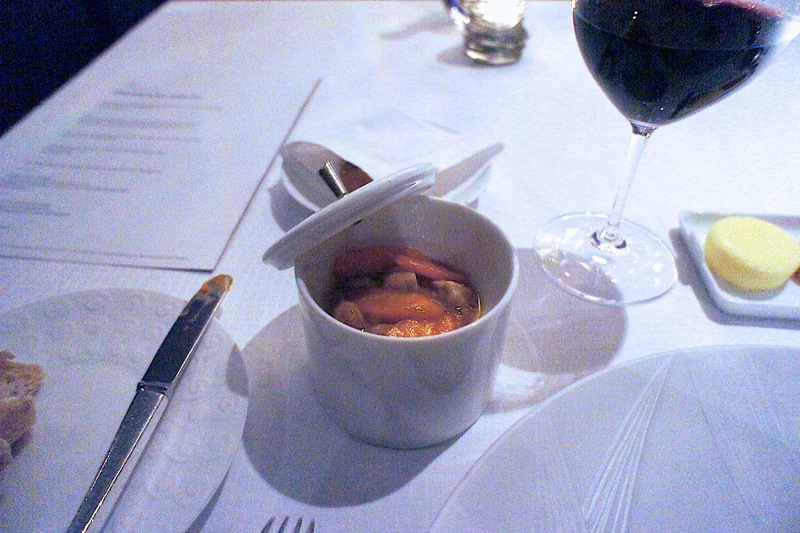 The veal loin was done as a stew with carrots and mushrooms and this was excellent. The breaded cutlet was ordinary at best (it looked and tasted like a dry pizza crust). 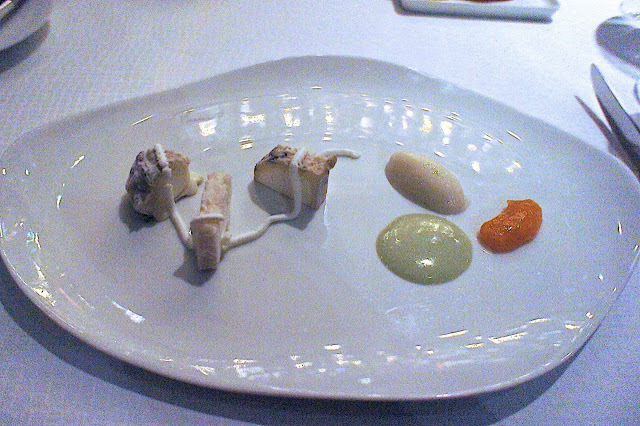 Cheese was also disappointing in that they did not bring out their cheese trolley and instead put on my table 3 types of French fresh goat cheese, accompanied with ewe milk veloute, almond paste and green tea, with pear sherbet with Roquefort blue cheese and kaki fruit pulp. 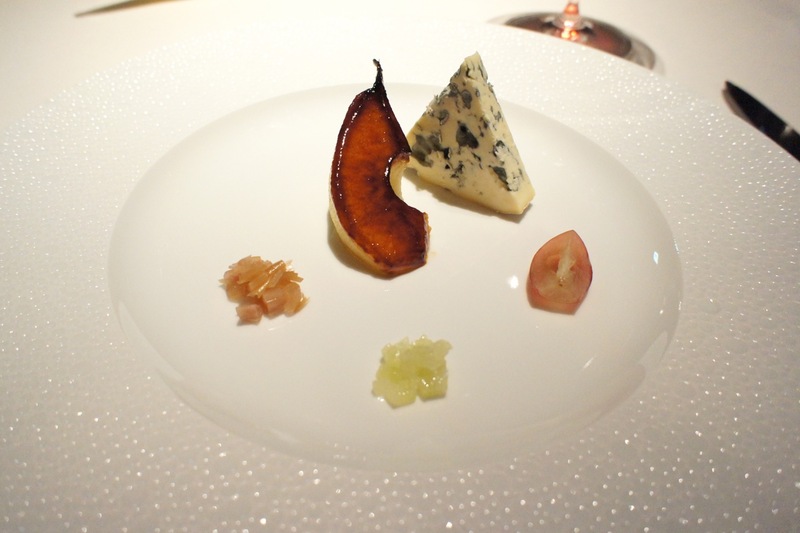 Other than the Roquefort, I didn't quite care for the other 2 cheeses. 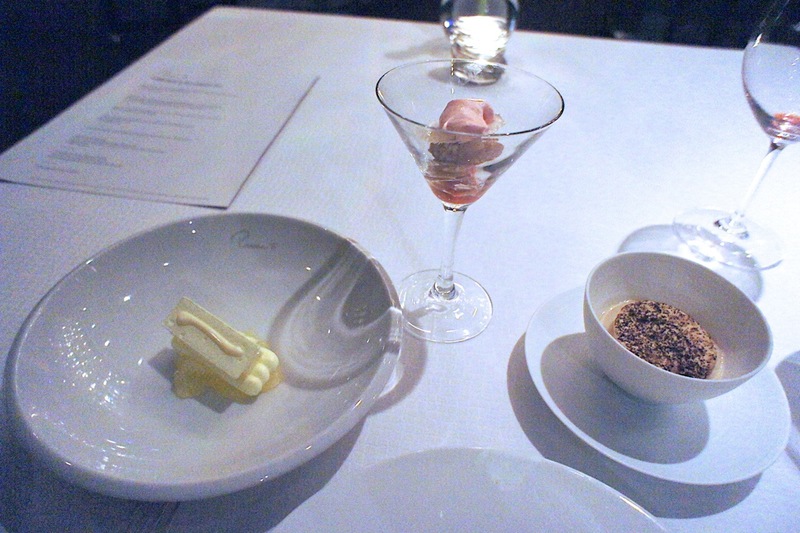 Dessert was simply described as 'Pierre Gagnaire's Grand dessert' and it was grand in quantity if not quality. At least seven (I gave up counting after a while) separate desserts were served during this time, ranging from sago cream, coffee mousse, neapolitan ice cream and fruit tart. There were a few good ones and a few pointless ones, but I wondered if it were to be better if the chef focused on producing one single dessert which would blow his diners away instead of trying too hard coming up with so many average ones. Final Thoughts: In all, I could not escape the feeling that this restaurant focused slightly too much on being a place to be seen in, and that the food was a secondary consideration. That said, some of the dishes were exquisite and would not be out of place being served in the 3-star Paris restaurant (e.g. the mushrooms, lobster and half of the veal dish). I expected modern innovative but in fact this was done very classically French. On a bright note, the wine pairing was very thoughtfully put together and the views out of the window were spectacular. 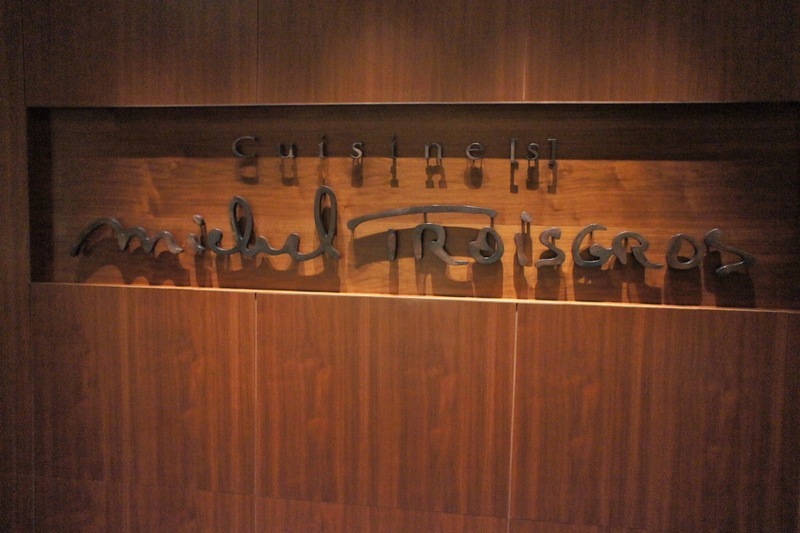 Cuisine Michel Troisgros is a 2-Michelin star French restaurant in Tokyo, and is the branch restaurant of the famed 3-star Troisgros in Roanne, France. Michel Troisgros is one of the titans of French haute-cuisine and his restaurant Troisgros is in our to-do list sometime in the near future. Therefore, it seemed appropriate for us to try his Tokyo restaurant in the meantime while we were in Tokyo, as we plan our trip to the French countryside in the coming years. The restaurant is located on the first floor of the Hyatt Regency in Nishi-Shinjuku, which appeared to be quite old with a rather dated and tired interior decor, but we were surprised that the restaurant itself was very classy. We started with some champagne and ordered a bottle of the 1999 Vosne Romanee Premier Cru "Les Rouges" from Domaine Jean Grivot, which was a decent claret. 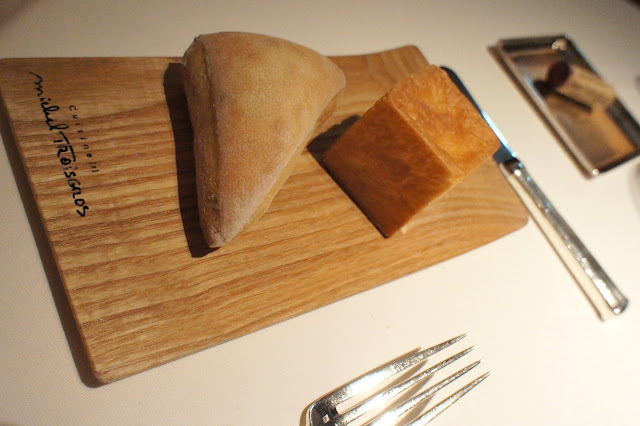 Amuse bouche was an interesting selection of foie gras covered with sesame seeds and some samosas. Something of this restaurant reminded us of La Calandre, perhaps it was the tableware and/or the lighting (see review: La Calandre). 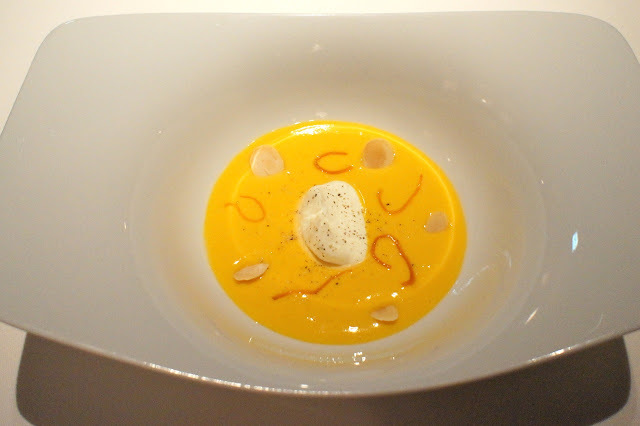 We started with a pumpkin soup with almonds which was very good, with the nuts providing a sweetness and a crunchy texture to the thick soup. The bread basket was excellent and the brioche was exceptionally good, to the point that we were afraid that we would end up eating too much of it to the detriment of the rest of our meal. The food at Cuisine Michel Troisgros tends towards the innovative with the use of fresh and natural ingredients, and every course reflected this philosophy. 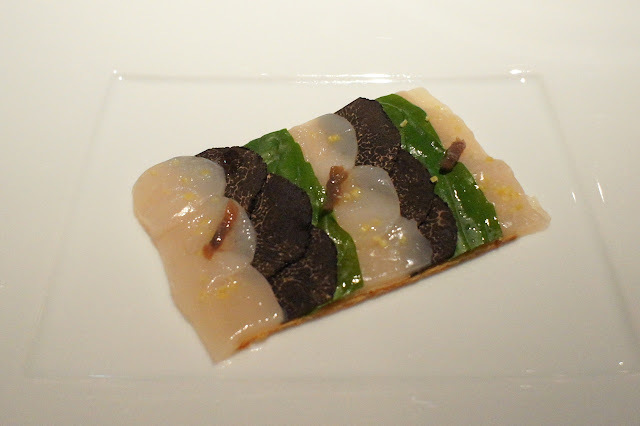 We had the superb scallops with basil and truffle on toasted slice-melba, which was a thin pastry with alternating slices of raw scallops, black truffle and basil leaves, with a touch of olives on the top. There was a clear diversity of tastes from the three ingredients (i.e. 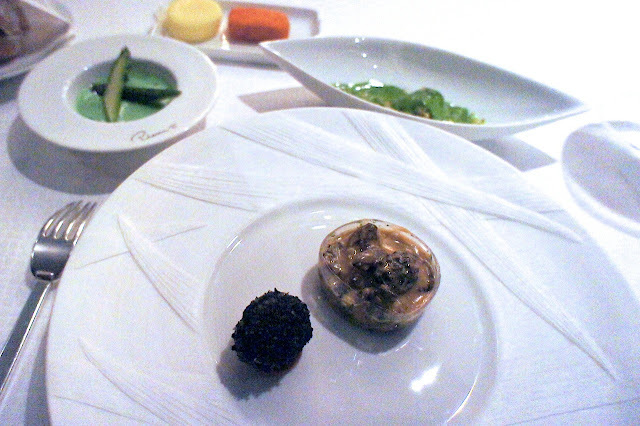 taste of the sea from the scallops, of the earth from the truffles and of herbs from the basil) which managed to combine very well on the palate. 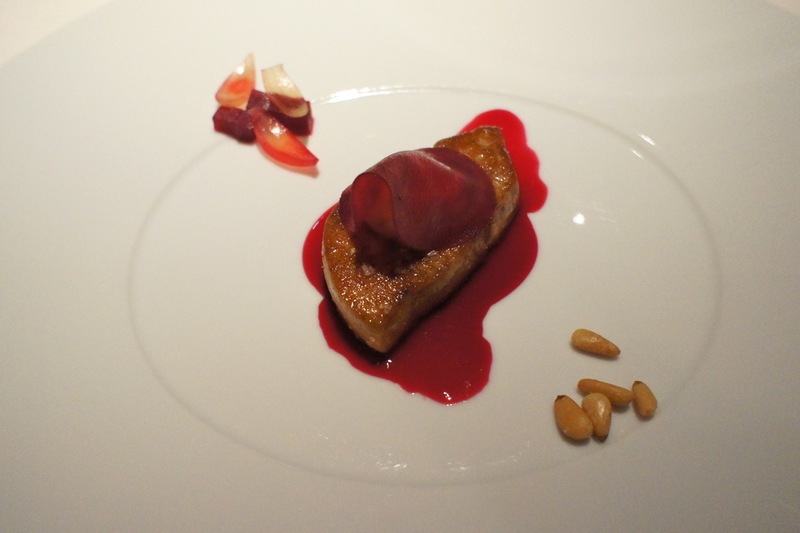 The next dish was the pan-fried foie gras with slightly acidic beet, rubbed apple and pine kernel. 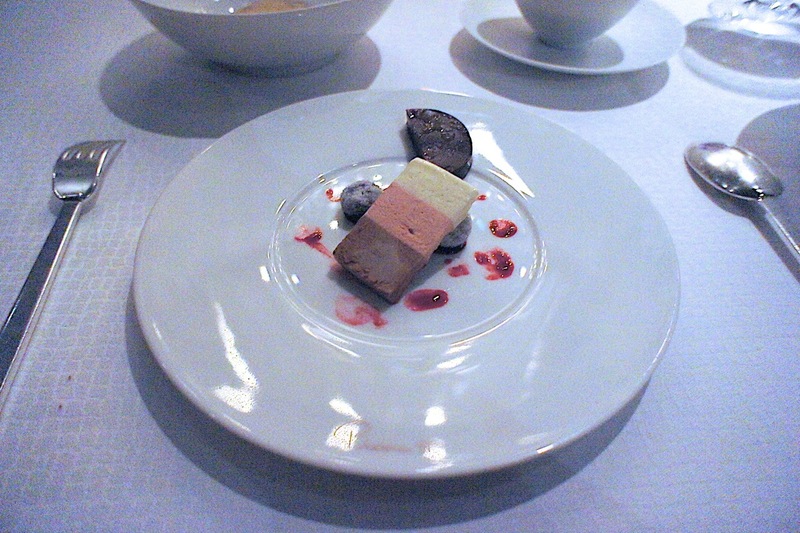 This was one of the better foie gras paired with beet dishes which we have eaten. In our experience, beet can sometimes be too sour and this adversely affects the taste of the liver. 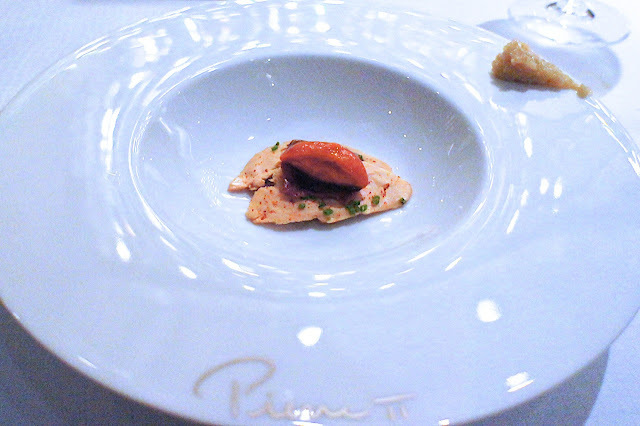 However, this dish was well balanced in that respect. The pine nuts were an interesting touch as well. 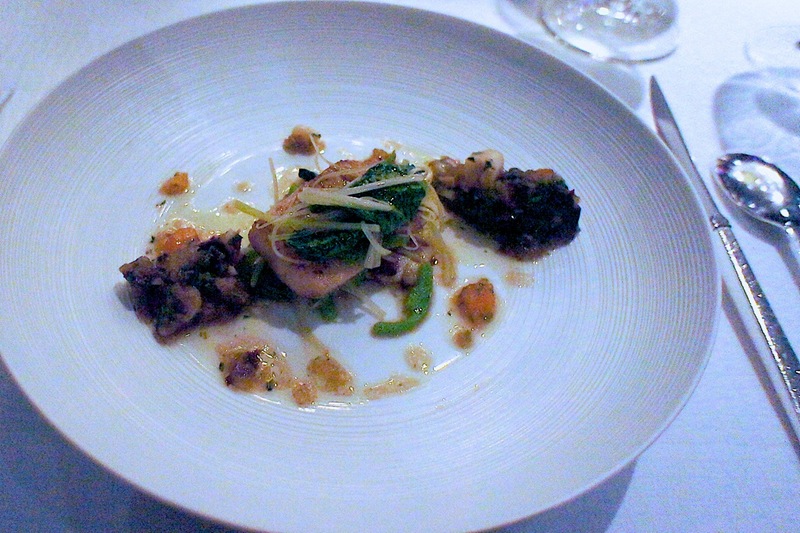 The roasted monkfish with preserved olives, grapefruit and saffron nage was also very good. The fish was juicy with a springy texture (as good monkfish should be poached) and the saffron and grapefruit broth was a good complement. The next dish was something rather familiar to us after the past week dining at Japanese restaurants. 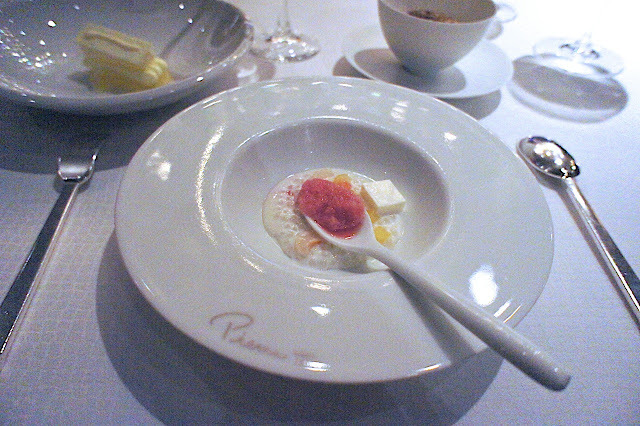 It was the spot prawn and squids, vanilla flavoured tomato water, celeriac and basil. 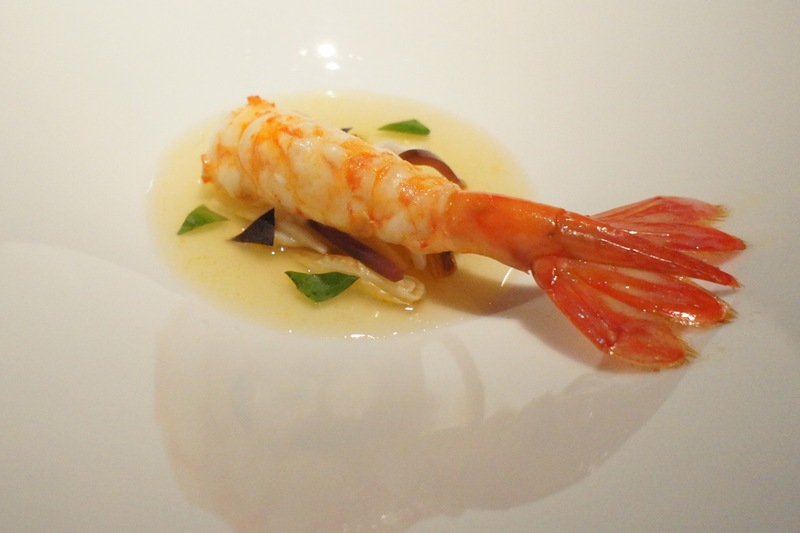 This particular prawn cooked in this particular manner was similar to the sushi we had been having all week, but in this case, instead of rice, the prawn was paired exquisitely with an elegant clear broth, herbs and pieces of squid. 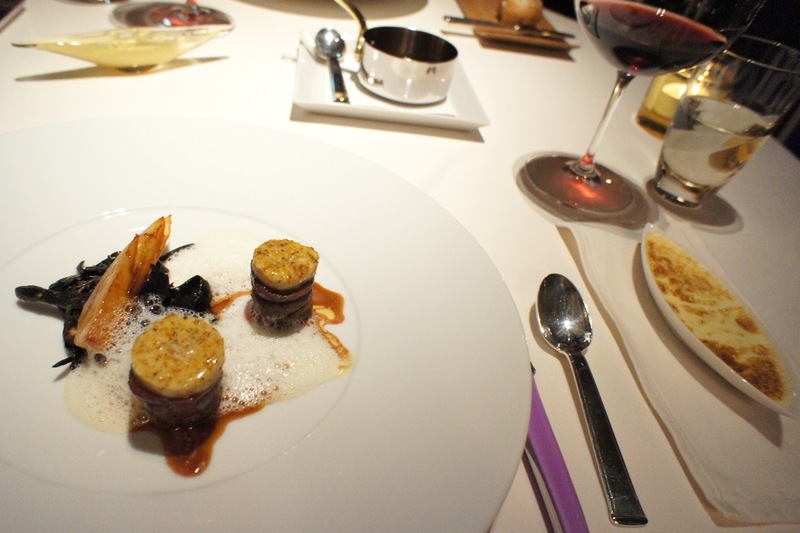 Finally, the meat course was the venison with orange butter, endive, black trumpets with roasted hazelnuts. This was accompanied by an excellent potato gratin side dish. Surprisingly, this was slightly underwhelming as the orange butter did not do much with the venison, although the potato and the sauces were very good. Curiously, we weren't shown the cheese trolley (perhaps it was due to the fact that there was already a cheese dish included in the menu), but fortunately, the one piece of cheese with this dish was a blue cheese which I liked: the forme d'ambert. This was delicious together with the caramelised pear. 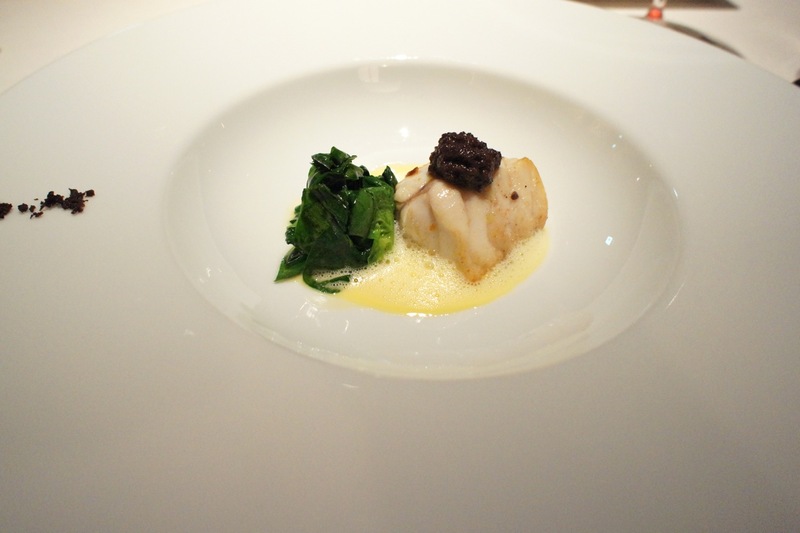 We did find the plate familiar though, and later realised that we had seen it at Caprice in Hong Kong a month ago (check out the fish course in the earlier review: Caprice). We particularly enjoyed dessert, as they were light and refreshing instead of the more customary heavy chocolate desserts. 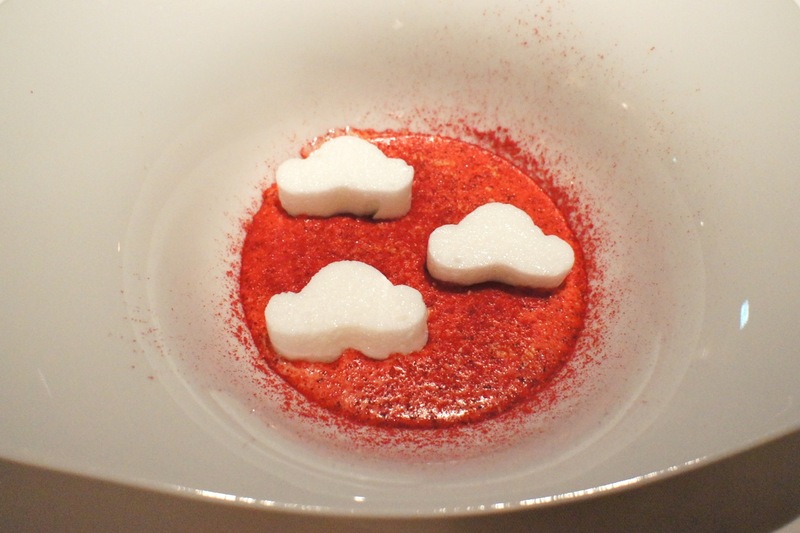 We started with the almonds and red berries 'soup' whereby the almond foam in the shape of clouds sat on top of a sweet water with red berries powder sprinkled thereon. 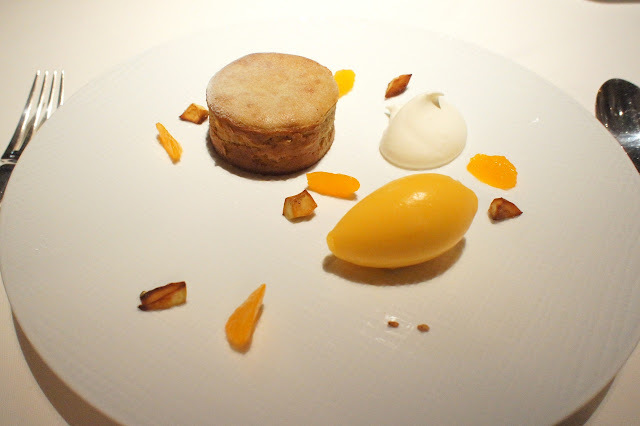 This was followed by the warm hazelnut cake with orange flower sherbet which was very good. 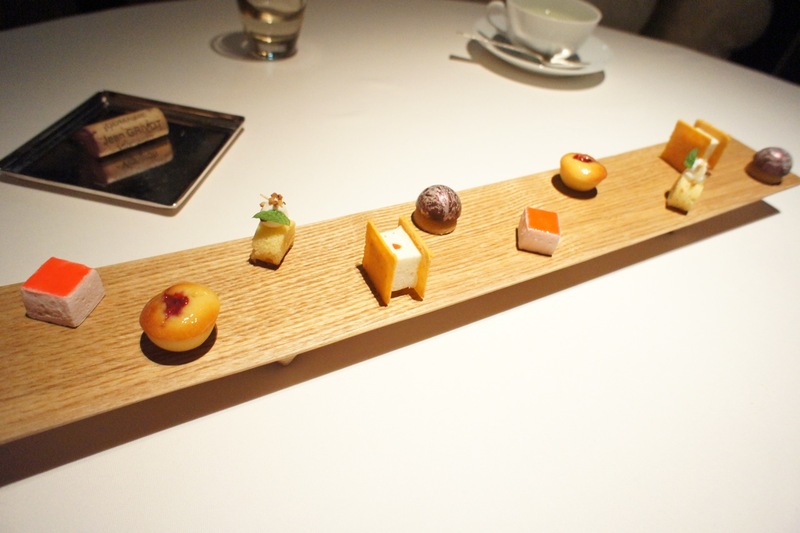 We loved the petit four selection, what with the cute bite-sized sweets like marshmallows and mini-muffins. We had a really great dinner here, as the food was innovative without being pretentious and every course tasted as good as it looked. We now look forward to dining at the main restaurant in Roanne.